September 7, 2013 by Maurice B. When thinking back to Sagetrieb’s long legacy of special issues devoted to single authors, one would be remiss not to remember the journal’s devotion to the modernist poet H.D. 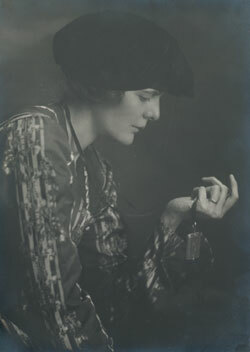 (1886-1961), of which four issues were devoted solely to scholarship on her work (more than any other single author). Do you believe you’re dead when you’re dead? Far from it! she’d answer — returning from Egyptian Karnak to London, presenting in exclamatory haste her great discovery to her friend Pearson — London is Karnak — you know? Meaning partly the Blitz is going on outside her window. When a roof falls down on you in London, this reveals something (think of Virginia Woolf resolving on, successfully attempting suicide because of an intuition that comes to her: this is WWI all over again!) And when ruins come to light in the sand — that’s when you know something. […] Negating vampires emerge from the tomb in the form of H.D.’s mystical wish that meaning exist where none is or can be. […] Experience means the present for the French author. For her, a glistening goal! Will those who read these words of mine when I’m dead one day empty them of the meaning I intend for them — in fairness proportional to me — as I’ve done with her?